No stray gets turned away. Hotel for Dogs is a funny, heartwarming and inspiring animal adventure that shows how far love and imagination can take you. When 16-year old Andi (Emma Roberts) and her younger brother, Bruce (Jake T. Austin), find themselves in a foster home with a strict "no pets" policy, they must use their quick wit to find a new home for their dog, Friday. When they stumble into an abandoned hotel, they realize they can transform it into the perfect place for Friday - as well as all the strays in the city. What began as a crusade to save one dog becomes a high stakes adventure as everyone around them starts to wonder - who let the dogs in? $17.012 million on 3271 screens. As a sucker for most things canine, I figured 2009’s Hotel for Dogs merited a look. The film focuses on orphaned siblings Andi (Emma Roberts) and Bruce (Jake T. Austin). They’ve bounced from one foster placement to another over the three years since their parents died, and now they’re stuck with self-absorbed wannabe rockers Carl (Kevin Dillon) and Lois (Lisa Kudrow). Through all of these placements, the kids go to pains to keep their dog Friday with them. This leads to all sorts of shenanigans – and a brainstorm. One day Friday takes refuge in an abandoned hotel, and he meets a pair of homeless pooches named Lenny and Georgia. Bruce comes up with the idea to turn the decrepit facility into a refuge for stray dogs. Assisted by some helpful teen pet store employees, they do just that. We watch as their endeavors take shape – and inevitable complications ensue. You know who likes movies like Hotel? My dogs. They respond to all the visuals and sounds of canines onscreen, and they also get plenty of extra attention from me. Like I said, I’m a sucker for the canines, so when I watch a dog-related flick, I have to give my pups additional love. Since she came from similarly modest origins, my fat, toothless old rescue dog Abbie really benefits from this. I must admit that I get a kick out of projects like this as well. 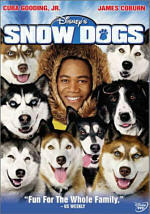 I really do adore canines, so I find it hard to resist the sight of so many lovable furballs onscreen for 100 minutes. I also love the theme of the movie, as I respect and admire all causes that benefit dogs. With so many cute pups and a story devoted to their rescue and care, it became inevitable that I’d enjoy Hotel. Once I eliminate the “I love dogs” factor from Hotel, it becomes tough to really defend. Cuteness is the order of the day. We get cute dogs, cute kids, cute gadgets designed to care for the cute dogs, cute kids working on the cute gadgets to serve the cute dogs… you get the picture. Heck, even the villains are fairly cute – and of course, they earn some redemption by the Great Plodding Inevitable Ending. To a large degree, I get the feeling someone wanted to support dog rescue organizations and decided to make a movie around that theme. Again, I love the concept, but this doesn’t ensure a quality piece of filmmaking. Nothing particularly awry occurs here, but Hotel fails to bring anything fresh to the table. It exists to make some money at the box office and stimulate pet adoptions. Maybe that’s why Don Cheadle ends up here. Perhaps he’s another dog lover and he wanted to support the cause. He does seem out of place in Hotel, though, as I’d think he’d risen to a status above the level of pedestrian family fare. Maybe he just needed a paycheck so he could continue to make better – but less well paying – flicks. A man’s gotta eat, and at least Cheadle emerges with his dignity intact, as his social worker character never gets submerged in poop or stuck with any other kind of cheap slapstick nonsense. As a piece of propaganda, I wholly support Hotel for Dogs and its efforts to advocate pet adoptions. As a movie, it’s pretty much a dud. If you love dogs, you’ll probably get something out of it, but it won’t do much for those who feel less gaga about scruffy pups. 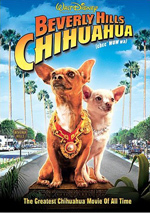 Hotel for Dogs appears in an aspect ratio of approximately 1.85:1 on this single-sided, double-layered DVD; the image has been enhanced for 16X9 televisions. Hotel came with a perfectly acceptable transfer. In terms of colors, the flick went with a fairly rich set of tones. Hues stayed on the natural side, with a mild golden feel to things. Within those parameters, the tones looked fine. Blacks were dark and firm, while shadows appeared clear and well-developed. The image didn’t really excel, but it was good. I didn’t expect much from the film’s Dolby Digital 5.1 soundtrack, but it turned out to be a bit more expansive than I anticipated. The soundfield opened up well, especially during a few louder scenes such as the thunderstorm that introduced us to the hotel. Other segments brought out good involvement as well, so the soundscape contributed a nice sense of atmosphere. Audio quality satisfied. Speech was natural and crisp, without edginess or other issues. Music showed nice range and delineation, and effects followed suit. Those elements displayed good accuracy as well as fine low-end when necessary; again, that thunder scene presented solid rumble and bass. Overall, the soundtrack worked quite well for the film. Expect a reasonable roster of supplements here. These start with an audio commentary from director Thor Freudenthal, producer Ewan “Jack” Leslie and actors Emma Roberts and Jake T. Austin. All four sit together for a running, screen-specific discussion of cast and performances, sets and locations, effects and music, costumes and visual design, and working with dogs. The adults offer the majority of the good information, and Freudenthal does most of the heavy lifting. The young actors occasionally give us some decent notes, but they usually just tell us what they like about the movie. Roberts also seems intent on blurting “oh my God!” as much as possible on a 100-minute period. Four featurettes follow. A Home for Everyone: The Making of Hotel for Dogs lasts 19 minutes, five seconds and includes Roberts, Austin, Freudenthal, Leslie, producers Jason Clark, Jonathan Gordon, and Lauren Schuler Donner, 2nd unit director Greg Michael, executive producer Ivan Reitman, animal coordinator Mark Forbes, special effects supervisor Michael Lantieri, production designer William Sandell, novelist Lois Duncan, key grip Aubrey Husar, and actors Lisa Kudrow, Kevin Dillon, Kyla Pratt, Johnny Simmons, Troy Gentile and Don Cheadle. The show looks at the novel and its adaptation, story and characters, cast and performances, working with the dogs, sets, production design and effects. Like many programs of this sort, “Home” mixes promotional fluff and production insights. Neither mode really dominates here, so take the good with the ehh. We do learn enough about the flick to make “Home” watchable, though. During the five-minute and 59-second That’s the Coolest Thing I’ve Ever Seen!, we hear from Freudenthal, Lantieri, Sandell, Reitman, Donner, Michael and sound designer Elliott Koretz. This one looks at the various Rube Goldberg-style inventions featured in the film. The show looks at these in a fairly superficial way, but it gives us a few fun facts about them. K-9 Casting goes for six minutes, 27 seconds and features Freudenthal, Leslie, Donner, Roberts, Forbes, Clark, and animal trainers Kristy Campbell and Steve Solomon. We learn a little about the dogs cast in the film and how the filmmakers got them to act. As with “Coolest”, the program runs by too quickly to be terribly deep, but it covers its material in a generally satisfying way. It’s nice to learn a bit more about how pips can be trained to work in this way. Finally, we move to the four-minute and 42-second Bark on Cue! featurette. It gives us notes from Koretz, Michael, and Leslie. Here we learn about the auditory challenges that came with the movie – and all those dogs. This turns into a tight, informative little piece. Eight Deleted Scenes fill a total of 10 minutes, 36 seconds. These include “At the Pawn Shop” (1:38), “Checks and Labor” (0:41), “Lois Singing” (0:47), “Photographic Memory” (1:21), “Sean and Jeanine” (3:01), “Vacation and Rescue” (1:21), “Theme Song” (1:01) and “Ruff, Ruff, Ruff” (0:46). Most of these fall into the category of minor exposition; they spell out things that we don’t really need to know. “Sean” is the most extensive but it wouldn’t have fit into the rest of the film well; it shows some prospective parents for the kids but makes them out to be loons. A couple of clips hint at tension between Lois and Carl, and I also think these were appropriate deletions. Those characters work best when cartoony, so the added depth given to Lois doesn’t work. Really, I don’t think any of the scenes merited inclusion in the film, but they’re interesting to see. In addition to the film’s trailer, we locate some Photo Galleries. These break down into “On-Set Action” (25 stills), “Puppy Love” (48) and “’Dog People’” (29). “Action” and “People” seem pretty ordinary, but I like “Love” since it includes nothing but shots of adorable pooches. A few ads open the DVD. We get clips for Imagine That, Madagascar: Escape 2 Africa, and icarly. These also appear in the disc’s Previews area along with pieces for The Spiderwick Chronicles, Charlotte’s Web, and Barnyard. Finally, the disc provides an ad for the Pedigree Adoption Drive. My love of canines carried me through Hotel for Dogs, but that doesn’t make it a good movie. It keeps the pooch-obsessed entertained well enough for its 100 minutes, but I can’t imagine it’ll do much for others. The DVD provides good picture and audio along with a pretty decent set of supplements. If you love dogs and have a high tolerance for goopy kiddie fare, give this one a look.